Alibaba Group announced that the first eWTP hub outside of China has gone live in a ceremony held in Malaysia and hosted by Malaysia Prime Minister Dato’ Sri Najib Tun Razak and Alibaba Group Chairman Jack Ma. 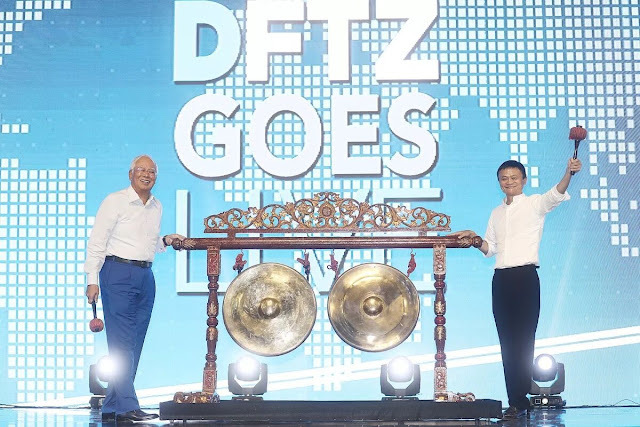 The milestone event follows Alibaba’s partnership announcement with the Malaysian Digital Economy Corporation (MDEC) in March this year to work jointly to enable Malaysian small and medium-sized enterprises to benefit from global trade. Alibaba Group Executive Chairman Jack Ma and Malaysian Prime Minister Dato’ Sri Najib Tun Razak survey a model of the future regional ecommerce logistics hub to be developed by Malaysia Airports Holdings Berhad and Cainiao, Alibaba’s logistics affiliate. Today’s ceremonies also included the ground breaking of a regional ecommerce logistics hub to be developed by Malaysia Airports Holdings Berhad and Cainiao, Alibaba’s logistics affiliate, through a joint venture announced today. The facility will enable speedy storage, fulfilment, customs clearance and warehousing operations. Malaysia represents the successful launch of the first international eHub as part of the eWTP initiative and many local merchants will benefit from the trade facilitation services. In future, more eHubs will create the global network necessary to facilitate trade for small and medium enterprises around the world.